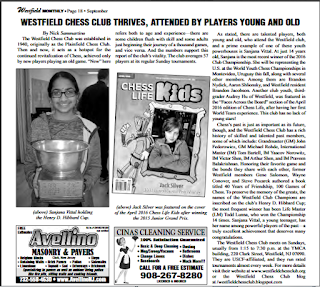 Grandmaster Alexander Fishbein won the Westfield Grand Prix held on June 25th. 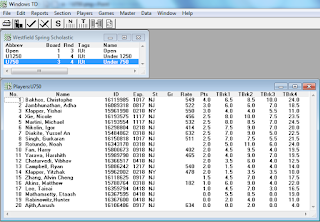 In the Under 1800 Section, Ramneek Singh, Nathan Cheung and Jonathan Qi tied for 1st. 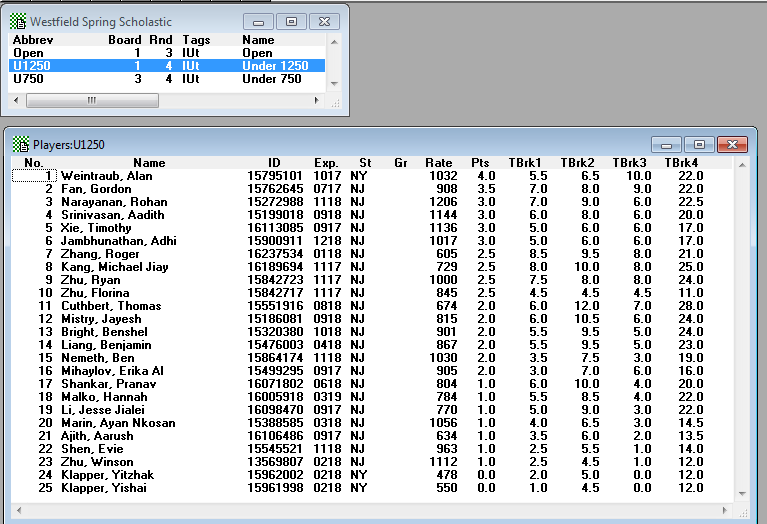 Shreyas Selvaraj was the U1200 Section victor. 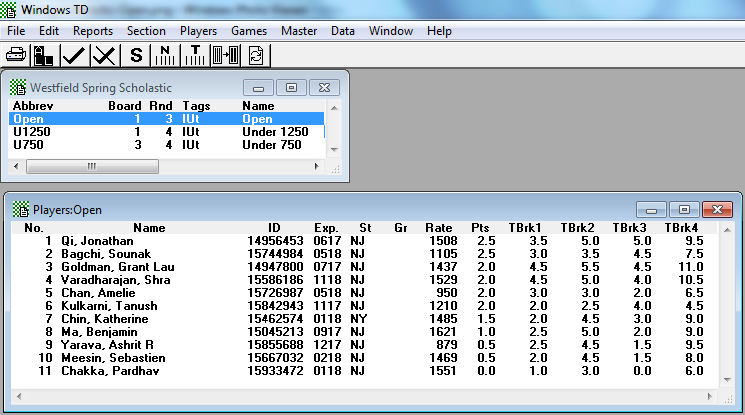 There were 86 players in all. 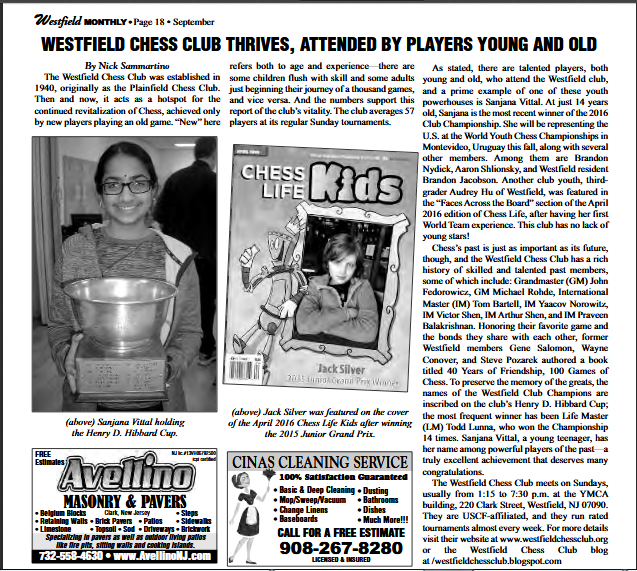 The Westfield Chess Club is featured in the July issue of Westfield Monthly. 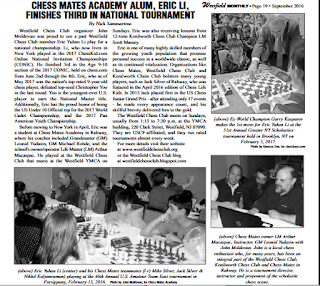 We thank publisher Joe Renna & columnist Nick Sammartino for the terrific write-up. 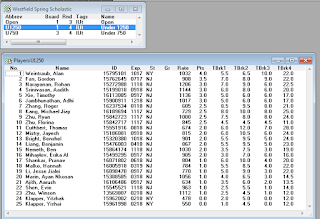 Former Westfield Chess Club member Eric Li finished 3rd in the Age 9-10 section of the 2017 ChessKid.com Online National Invitation Championships (CONIC), held on chess.com from June 2nd thru 4th. You can read of Eric's success in the July issue of Westfield Monthly, one of 18 local papers published by Renna Media. Correction: The article incorrectly states the Li family moved to NY. In fact, they now reside in California. From L-R: Jonathan Qi (1st place), Sounak Bagchi (2nd), Shravan Varadharajan (4th), Amelie Chan (5th). Not pictured: Grant Goldman (3rd) and Tanush Kulkarni (honorable mention). From L-R: Gordon Fan (2nd place), Aadith Srinivasan (4th), Alan Weintraub (1st), Adhithya Jambhunathan (= 5th) and Timothy Xie (= 5th). Not pictured: Rohan Narayanan (3rd). From L-R (holding trophies): Adharrsh Jambhunathan (2nd place), Michael Martini (3rd), Yishai Clapper (4th), Nicole Xie (5th) and Christopher Bakhos (1st). Not pictured: Igor Nikolin (honorable mention), Yussef Diakite (h.m.) and Gurkuran Singh (h.m.). 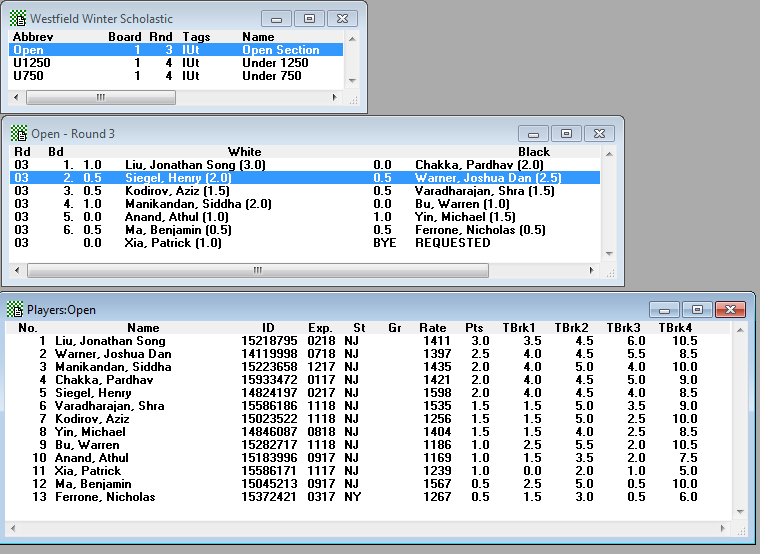 Jonathan Qi (1529), Alan Weintraub (1032) and Christopher Bakhos (549) were section winners in the Westfield Spring Scholastic, held on April 23rd. Siddarth Manikandan (3rd place) & his family. 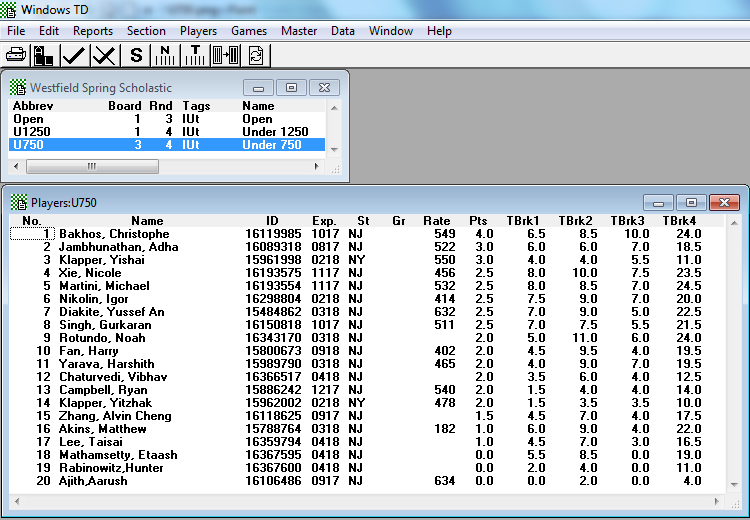 Not pictured: Jonathan Liu (1st), Joshua Warner (2nd), Pardhav Chakka (4th), Henry Siegel (5th). 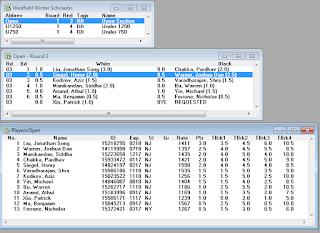 Corrected Final Standings, in tiebreak order. Trophy winners from the U1250 Section of the Westfield Winter Scholastic, held on January 15th. From L-R: Tanush Kulkarni (1st place), Lev Koganov (2nd), Eric Levin (4th), Asgar Musaji (3rd) and Timothy Xie (5th). Not pictured: Alan Hu (honorable mention). From L-R: Yussef Diakite (1st place), Adikansh Khanna (2nd), Neil Chowdhury (3rd), Eli Rosenblatt (4th) and Saharsh Bangaru (5th). Jonathan Liu (1408), Tanush Kulkarni (1058) and Yussef Diakite (446) were section winners in the Westfield Winter Scholastic, held on January 15th. 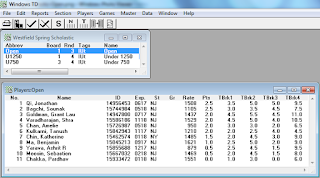 Due to a variety of factors we have fallen some 6 months behind in posting but reports on our 2017 Winter Scholastic, Spring Scholastic, Grand Prix, NJ Open Qualifier & today's Summer Scholastic will be forthcoming.